Baseball season is here and I could not be any happier about it. My love for baseball dates back to being a kid growing up in the cold Midwest. The start of baseball season meant that summer was coming. Sure, there was still the occasional snow at Wrigley Field in April or the games that required a down coat and thermal underwear because the wind off Lake Michigan was debilitating. Still. The start of baseball marked the start of my favorite season and that happy feeling never got old. Today I live in a summer-all-year sort of place but I still find myself giddy when I see the first pitches of the season being thrown out. This year was really special because my husband’s team, the Miami Marlins, had the honor of hosting the only game on Opening Night in their new stadium. My husband loves Miami the way that I love Chicago. So even though I’ve never been a Marlins fan, per se, it made me happy to see such pride in him for his team and his hometown. The Cubs are my favorite team but I’ve found in the past few years that I like to watch just about any team play. I dislike the Cardinals in a “they think they are SOOO great” sort of way (and most of the time, they ARE so great… ugh… I hate them) and would never dream of cheering for a team that was playing my beloved Cubbies. I don’t hate the White Sox the way that I probably should and now it appears that I will have to form some sort of love for Ozzie Guillen since he has moved to the Marlins clubhouse. But I digress. The point is that I’m a fan of the game. And my season is here. My daughter knows a little bit about baseball and shouted the words “Go Cubs!” anytime that any sport came on the TV for awhile there. My husband has done his best to straighten her out. My stepson is sort of disinterested in the sport thus far but I realize that if most adults find the sport boring, it is pretty likely that a 5-year-old will too. An interesting development in our house has been the way that my two-year-old stepdaughter has suddenly decided that she likes baseball. It started when my husband took her to a spring training game in Viera. 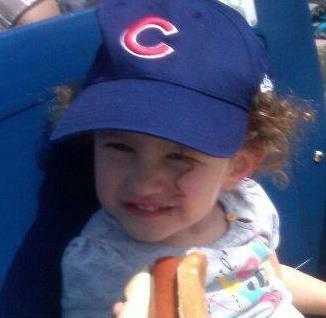 She wore a Cubs hat, ate a hot dog and clapped for the players. She has not stopped talking about going to another game since. Sure, maybe she is more intrigued with the idea of time alone with daddy and the promise of ballpark food than the actual sport, but whatever the case, my husband is thrilled. I think it’s pretty darn cute myself. She actually sat with us this afternoon for several minutes at a time and watched a game. It has been great getting to share something that I love so much with my family and I hope that it remains a bonding experience for all of us as the years go by. What sports do you love in your household? Are there other pastimes that bring your family together?